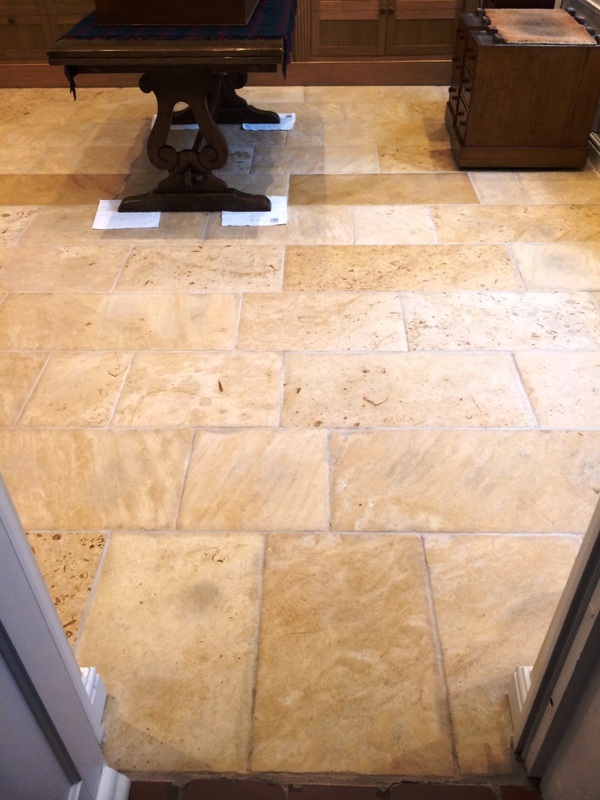 The photographs below of a Honed Limestone tiles fitted in the living room of a house in Marlborough. The tiles were proving difficult to keep clean especially around the high traffic areas such as the doorway, I suspect the sealer had worn down and dirt was now becoming ingrained in the pores of the stone. The first job was to remove any surface dirt and get the grout clean so a strong dilution of Tile Doctor Pro-Clean was mopped onto the floor and left to dwell for around ten minutes before being scrubbed into the tile and grout lines with a stiff brush. We then removed the dirty cleaning solution with a wet vacuum and rinsed the floor with clean water. The next step was to burnish the Limestone tiles using a set of diamond burnishing pads starting with the coarse or number 1 pad as it’s known. This is run over the stone in conjunction with a little water and is designed to remove old sealers and other surface coatings and clean at the same time. The resultant milky slurry is the removed using a wet vacuum and the floor rinsed before repeating the whole process with the medium (number 2) pad and fine grade (number 3) pad. The Limestone tiles were then given a final rinse and left to dry overnight. I should point out the Limestone was honed as opposed to polished so there was no need to apply the final pad which is used to bring up the polish on stone. I returned the next day to seal the floor checking first that it was dry by taking multiple readings with a damp meter. The result were fine so I was able to move quickly onto sealing the floor for which I used two coats of Tile Doctor Colour Grow which is a versatile impregnating sealer that occupies the pores in the stone preventing contaminates from lodging there and enhancing the colours in natural stone. 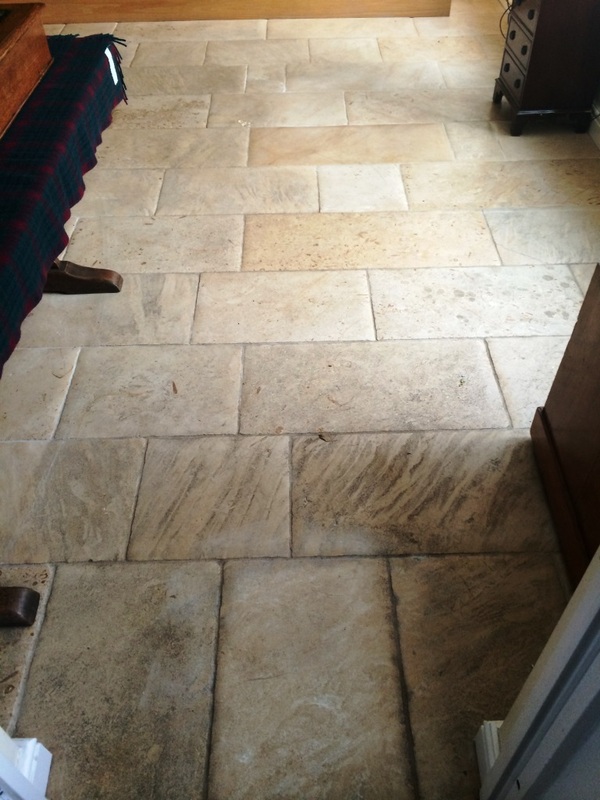 This entry was posted in Limestone Posts and tagged cleaning service, floor restoration, liemstone tiles, limestone floor, Marlborough, sealing limestone tiles, suffolk, tile cleaning, tile maintenance, tiled floor, wiltshire by AbzDominise. Bookmark the permalink.